President Barack Obama’s meetings with Middle Eastern leaders next week will be his most extensive engagement yet with an issue that has been a weak spot in his largely positive international image. 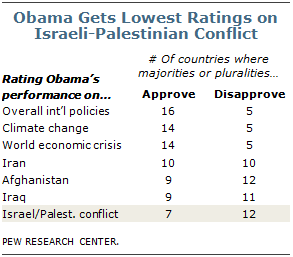 When the spring 2010 Pew Global Attitudes survey, which was conducted in April and May, asked people in 22 countries around the world to rate Obama’s performance on a variety of foreign policy issues, he received his lowest marks on dealing with the Israeli-Palestinian conflict — and his ratings on this issue were especially negative in the Arab nations of the Middle East. The poll found that global publics largely take a positive view of Obama’s leadership and his overall foreign policy. Majorities or pluralities in 16 of 22 nations say they generally approve of his international policies. The American president also receives largely positive ratings for dealing with two broad global challenges: climate change and the world economic crisis. However, reviews are mixed for Obama’s handling of three specific trouble spots: Iran, Afghanistan and Iraq. And on the Israeli-Palestinian conflict, assessments of Obama are on balance negative. Majorities or pluralities in 12 nations disapprove of how he has dealt with the conflict, while majorities or pluralities in just seven countries say they approve (in three nations a plurality offer no opinion). Ratings for Obama’s performance on this issue are decidedly poor in the six predominantly Muslim nations included in the survey, and they are particularly negative in the three Arab nations polled that border Israel — more than eight-in-ten Lebanese (90%), Egyptians (88%) and Jordanians (84%) say they disapprove. On many questions, including questions about America’s image, there are sharp divisions among Lebanon’s major religious groups, but on this issue there is little disagreement — 84% of Lebanese Sunnis, 87% of the country’s Christians and a remarkable 100% of Shia respondents disapprove of the way Obama has handled the Middle East conflict. About two-thirds in Turkey (66%) and half (51%) in Pakistan also hold this view. In both of these countries, only 5% approve of Obama’s performance, while large numbers offer no opinion. Even in Indonesia, where Obama’s connection to the country — he lived there for several years as a child — typically boosts his ratings as well as America’s overall image, 56% disapprove of how he has handled the conflict between Israelis and Palestinians. Previous polling has demonstrated that in Muslim majority nations expectations have been low for Obama on this issue since early in his presidency. In a spring 2009 Pew Global Attitudes survey, more than 60% in Jordan, Egypt and Lebanon said they did not believe Obama would be fair in dealing with the Israelis and Palestinians. Seven-in-ten held this view in the Palestinian territories, which was included in the 2009 poll. Indonesia was the exception to this pattern — a 54% majority felt that Obama would be fair on this contentious issue. The low expectations for Obama and his current low ratings on this issue reflect the fact that for some time the U.S. has been perceived as taking Israel’s side in the conflict. For instance, a 2007 Pew Global Attitudes poll found overwhelming majorities in Arab nations — including about nine-in-ten Jordanians, Lebanese and Palestinians — saying that U.S. policies in the Middle East favor Israel too much. Certainly, in recent decades American public opinion has leaned toward Israel. Pew Research Center polling dating back to the early 1990s has consistently shown that, when asked which side they sympathize with more in the Middle East conflict, Americans are much more likely to side with Israel than the Palestinians. Public support for Israel tends to be stronger in the U.S. than in other regions of the world, including Western Europe. The 2007 survey found that among several of America’s key European allies — such as France, Britain and Spain — there was more sympathy for the Palestinians than for Israel. In addition to assigning him negative marks on the Israeli-Palestinian conflict, Muslim publics also tend to give Obama unfavorable ratings on Iran, Afghanistan and Iraq. Moreover, beyond specific issues, respondents in majority Muslim nations tend to express little confidence in Obama’s general foreign policy leadership. Only 43% of Lebanese, 33% of Egyptians, 26% of Jordanians and 23% of Turks say they have confidence that Obama will do the right thing in world affairs. The country with the lowest overall opinion of Obama, however, is Pakistan — only 8% of Pakistanis express confidence in him. On the other hand, despite Indonesians’ disapproval of how Obama has managed specific issues, two-thirds (67%) trust his overall leadership in the international arena. Obama’s ratings have grown slightly more negative among Muslim publics since 2009, especially in Turkey, where confidence in his leadership slipped ten percentage points, as well as in Egypt, where it dropped nine points.